UTCS-25 Miss Monrow Scissors Steve! Description: Strapping Dutch amazon Miss Monrow (6'1" and 210lbs.) comes to Utopia and scissors our lucky victim Steve. She lets her hair down for us literally and figuratively in a one-of-a-kind clip that she admittedly said she had never produced before. Lucky us! So we brought our measuring tape and squeeze-o-meter along to get the legit stats on the awesome giantess. And even though Miss Monrow is in her off-season condition, she was kind enough to wear a super tiny bikini so you could see all of her! We talk with her a little while measuring and she throws some super-nice flexes at us, so it's a mini posing video as well. Miss Monrow's biceps are a legit 16", her thighs are a massive 26.5" and her calves an enormous 17". Then she hit the squeeze-o-meter for 310 mind-erasing pounds of pressure. Next it's on to Steve. Before the match, Steve was proud to tell Miss Monrow how he trains in crossfit blah, blah, and how much he squats, etc... but that proves to be a big mistake because she uses that against him throughout. Miss Monrow starts slow because Steve is nervous, and when you see how small his head is in between her massive slabs of granite you'll understand why! The squeezing portion is 10 minutes as Miss Monrow scissors Steve in classic straight-leg scissors, figure fours, then a jaw-crushing reverse head scissor and panic-inducing reverse figure 4. She sexily taunts him to escape, as his nervousness turns to terror, and she has him tapping his desperate submission many times. In the end Miss Monrow lets him worship her a little as she stands over him flexing in a classic victory pose. Check out all the fun we had as Miss Monrow Scissors Steve! 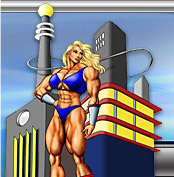 Miss Monrow is THE most awesome female bodybuilding-wrestling amazon in the world today and she's here at Utopia! 18+ minutes, 1920 x 1080 full HD, 889mb, and offered at a special price of only $16.95. Enjoy!